Northern Harriers usually hold their long wings in a slight "V," as they glide slowly and effortlessly above grasslands and marshes looking for small rodents. The males are gray and the females are brown, but both have a distinctive white rump patch, which is obvious in flight. They are generally found in Tennessee during the non-breeding season, but in 2002, there was an unsuccessful nesting attempt on Fort Campbell in Stewart County. The Northern Harrier's breeding range extends across Alaska and Canada, and into the northern United States. In winter, they are found in southern Canada and throughout the United States, southward throughout Central America to northern South America, and in the Caribbean. Description: The Northern Harrier has long, slender, rounded wings, a long tail, and a large white rump patch. The male is gray above and light below, with black wingtips. The female and first year birds are brown above, and striped brown and white below. As with most birds of prey, the female is larger. Rough-legged Hawk, a rare winter visitor to Tennessee, has white at the base of the tail, not on the rump. It also hunts over open areas, but has broader wings, a shorter tail, black on the belly, and shows white on the underside of the tail. Habitat: Open wetlands, meadows, pastures, prairies, grasslands, croplands, and riparian woodlands. Diet: Small mammals, birds, reptiles, and frogs. Nesting and reproduction: Northern Harriers roost and nest on the ground, often in groups, in traditional locations. They usually nest when 2 to 3 years old, but may be able to breed their first year. Northern Harriers are known to be polygynous, with a single male mating with 2 or more females. Clutch Size: The female lays 3 to 6 eggs. The number appears to depend on the abundance of small rodents. Incubation: The female incubates for 29 to 31 days. Fledging: The male provides the bulk of the food to the young, which fledge 4 to 5 weeks. Nest: Northern Harriers nest on the ground in thick grass, shrubbery, or other vegetation. The nest is a platform of sticks and grass. Status in Tennessee: Northern Harriers are a fairly common to uncommon migrant and winter resident across the state, and a very rare summer resident. They are usually present in the state from late August to early May. In 2002, there was an unsuccessful nesting attempt on Fort Campbell, Stewart County. This represents the first documented nesting attempt in the state. 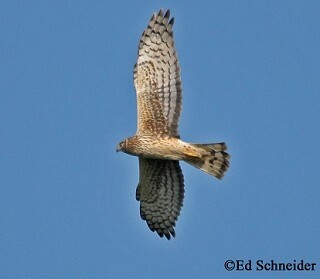 The Northern Harrier is listed as In Need of Management in the State of Tennessee. Northern Harriers have a facial disk similar to that of an owl. This disk helps with directional hearing, and like an owl, they uses their sense of hearing to help locate prey. The oldest Northern Harrier on record was 16 years, 5 months old. Northern Harriers also breeds across Europe and Asia where they are known as Hen Harriers. Best places to see in Tennessee: Open fields, agricultural areas, especially during the winter, across the state. They are active throughout the day as well as at dawn and dusk.